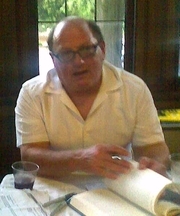 Oscar Hijuelos has 2 media appearances. Oscar Hijuelos is the international bestselling author of eight novels, including The Mambo Kings Play Songs of Love, for which he became the first Latino to win the Pulitzer Prize for fiction. He has also received the Rome Prize and prestigious grants from the National Endowment for the Arts and the Guggenheim Foundation. He lives in New York City. In his memoir, Thoughts without cigarettes, Hijuelos turns his pen to the real people and places that have influenced his life and, in turn, his literature. He has enchanted readers with vibrant characters who hunger for success, love, and self-acceptance. In his first work of nonfiction, Hijuelos writes from the heart about the people and places that inspired his international bestselling novels. Born in Manhattan’s Morningside Heights to Cuban immigrants in 1951, Hijuelos introduces readers to the colorful circumstances of his upbringing. The son of a Cuban hotel worker and exuberant poetry- writing mother, his story, played out against the backdrop of an often prejudiced working-class neighborhood, takes on an even richer dimension when his relationship to his family and culture changes forever. During a sojourn in pre-Castro Cuba with his mother, he catches a disease that sends him into a Dickensian home for terminally ill children. The yearlong stay estranges him from the very language and people he had so loved.With a cast of characters whose stories are both funny and tragic, Thoughts without cigarettes follows Hijuelos’s subsequent quest for his true identity into adulthood, through college and beyond-a mystery whose resolution he eventually discovers hidden away in the trappings of his fiction, and which finds its most glorious expression in his best-known book, The Mambo Kings Play Songs of Love. Illuminating the most dazzling scenes from his novels, Thoughts without cigarettes reveals the true stories and indelible memories that shaped a literary genius. Oscar Hijuelos discusses Thoughts Without Cigarettes. Oscar Hijuelos signs Thoughts Without Cigarettes. Oscar Hijuelos promotes Beautiful Maria of My Soul. Oscar Hijuelos promotes Dark Dude. Oscar Hijuelos's book Beautiful Maria of My Soul was available from LibraryThing Early Reviewers. Oscar Hijuelos is currently considered a "single author." If one or more works are by a distinct, homonymous authors, go ahead and split the author. Oscar Hijuelos is composed of 8 names. You can examine and separate out names.